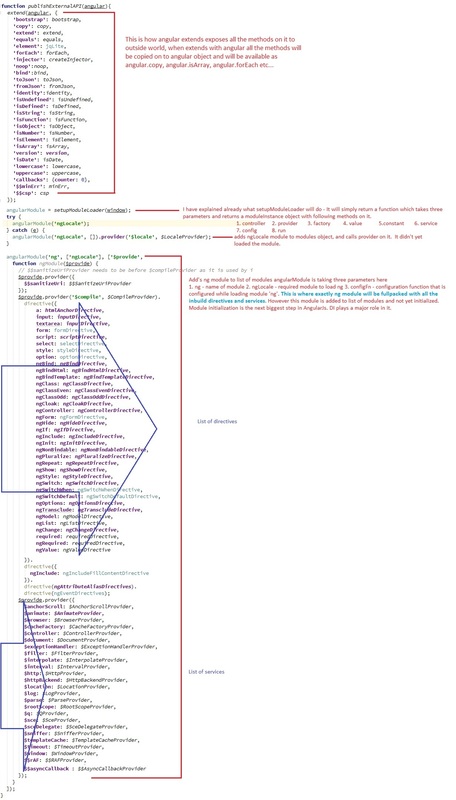 Banging my head for 2 days gave me some insight into how AngularJs loads modules. In the previous posts I have been talking about $injector, $provider, DI, createInjector bla bla bla.. All the information I have shared researching online material gave me bits and pieces of information but not a complete picture. Then I have decided to go through source code, with the knowledge gained from previous research I was able to understand how it’s achieved. This post is going to be a bit longer. concepts like $injector, $provider, DI are touched in this post, which are covered in detail in my previous posts. *Click on images to open in new tab for reading explanation for the code. and lot more.. By End of this post you will get answers to most of your questions. First of all angular.js is a self invoking function which takes two parameters window & document. When we include this script file in html all the code is executed once and variables are set if any. This will help AngularJs to publish it’s internal methods which can be accessed via keyword angular. Example: angular.extend, angular.bootstrap, angular.injector, angular.toLowerCase etc..
angular is added as property to window object whose value is empty object. publishExternalAPI(angular) – makes available list of commonly used methods globally. angularInit(document, bootstrap) – This will bootstrap module provided on document via ngApp or using angular.injector(). 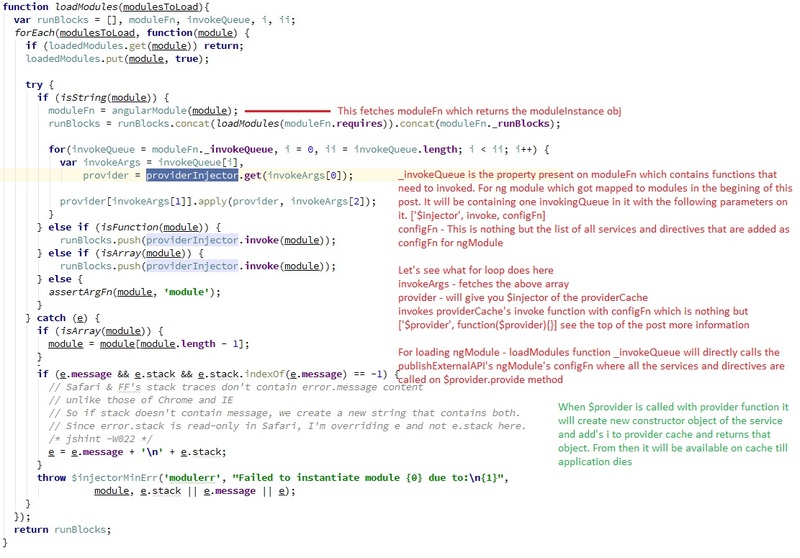 In short, setupModuleLoader will add module to angular.module.modules object with moduleInstance contaning controller, filter, provider, factory, value, constant, config run, _invokeQueues and _runBlocks these 2 queues get filled when invoke function is called on any of the above functions are called on module, refer image for better understanding. ng – This module has configFn where all the setup related to inbuild services & directives is there. angularInit(document, bootstrap): angularInit is the place where bootstrapping is done, This is where module loading and Dependency Injection starts. After some initial startup angularInit finally calls bootstrap function on the element. Bootstrap: After some initial setup bootstrap calls doBootStrap function which finally returns our eagerly waiting $injector on successful loading of modules. Enlarge picture for more details on what doBootstrap does. Bootstrap calls createInjector method with list of modules that needs to be loaded. This includes ng module as well, what does createInjector method with the array of modules given to it ? $provider – with six methods on it provider, value, constant, service, factory and decorator. instanceCache – contains $injector method on it and this injector will be returned by createInjector method. 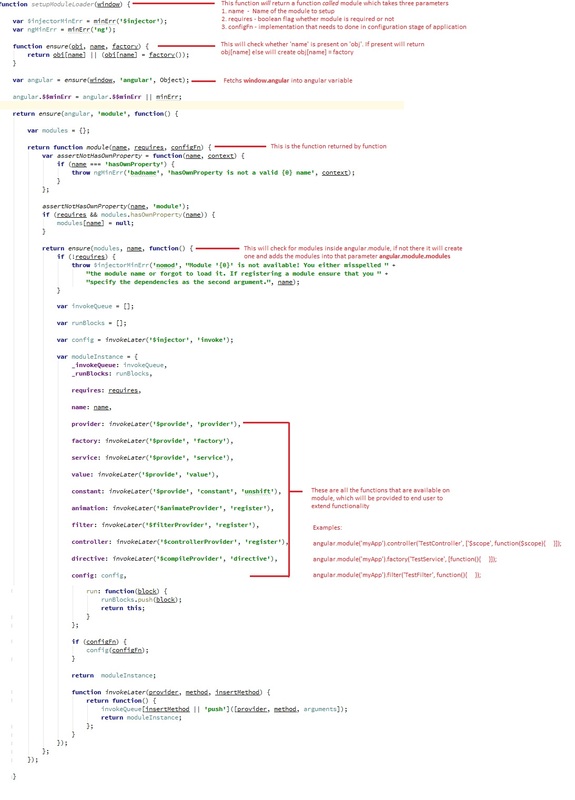 instantiate – creates new service object. has – checks whether the service present or not in cache. so only part left is loadModules, let’s explore it. click on image to open in new tab to read comments beside code for more information.